Below is a great collection of business models including information on revenue models and how much musicians, labels and songwriters are compensated. It has been put together by Future of Music Coalition, a nonprofit organization that works to ensure a diverse musical culture. There are many great examples in the presentation and attached pdf files from services such as: CD Baby, TuneCore, ReverbNation, Nimbit, The Orchard, iTunes Music Store, Amazon Music Store, Amie Street, Rhapsody or Napster, eMusic, Magnatune, ArtistShare, Kickstarter, Sellaband, Rumblefish/Pump Audio, Pandora, Last FM, MySpace Music, KEXP, Sirius XM Satellite Radio and MusicChoice. Also, examples from artists such as Issa/Jane Siberry, Radiohead, Nine Inch Nails and Jill Sobule. 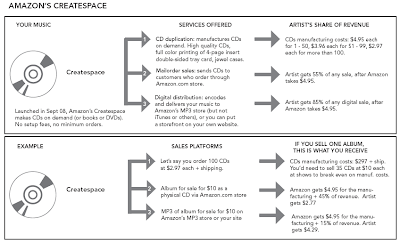 Music distribution channels such as Amazon's Createspace. Great Post. Keep the good work.